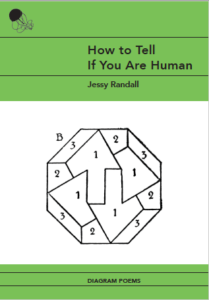 How to Tell If You Are Human, Jessy Randall’s book of diagram poems, seems by the title to be an instruction manual of sorts. It is that, but it’s also an announcement of a test: this book puts forth diagrams – floorplans of atriums, drawings of gravispheres, and others even more inscrutable. The test is a simple, ergo elegant one: Do you relate? Yes? Congratulations! You’re human. It’s a hug of a book, an affirmation of acts felt or done, and is as irreverent of a collection as you might find. Randall’s previous book, Suicide Hotline Hold Music (Red Hen Press, 2016), deftly paints human portraits framed with a humor that gradually swings towards a more weighty tone. This irreverence is maintained in How to Tell If You Are Human, as are the emotional arcs – in these diagram poems, however, those arcs are sharper, often doing the same work with a picture and a few words. How to Tell If You Are Human is both unusual and unusually funny, as it often challenges the simplest of assumptions one has when approaching a poem: Where to put your eyes and begin reading. Many of the diagrams cover the entire page, drawing attention to places other than top-left. This, combined with Randall’s quickness and humor, distills what a poem does and is, and it attempts to do the same for the gamut of human life and emotion. The words on the two barrels are immediate and subversive, and the image is transformed – two boxers become two men slow dancing, as the poet turns blood sport into an act of tenderness, and in so doing, paints the world with her own hopes for it. This diagram poem is surprising in the typical, “you zigged when I thought you would zag” sort of way. But more than that, Randall hints at what might be understood as the exercise of the book. The second boxer’s (lover’s?) reply encourages his opponent (partner) to not speak – in a form defined, and sometimes overwhelmed by, speakers speaking, these poems attempt to speak as little as possible. And yet, a certain personality exudes, as the reader is destabilized, asked to step off of the solid. This is achieved in six words and an image. You are special Everyone is special. It feels like meddling to comment on the poem, since it seems its goal is to not be the subject of deep thought, but rather to induce such thinking. However, meddle I must, and so I say: the only reaction this reader could muster was a nod and an assenting, yes, that is the way things are. In keeping with the rest of the book, the diagram achieves a universality that comforts. And so, there is an appeal here for many sorts of readers: those who enjoy formal experimentation, those who dig the line-surprise, as well as those who turn to art so that they may say, “yes, this is what my life is like.” The book displays a certain force of thought, one that causes appreciation and introspection. It also forces a reconsideration of why poets make poems the way they make them, and of the hilarious, infuriating chore of being human. Hayden Bergman lives and writes in Abilene, Texas. He is a graduate of Fairleigh Dickinson University’s M.F.A. program. He is the Books Editor of TLR.